"Bratz, the iconic fashion doll, has been relaunched with a new look and an ethos that engages with today’s girl"
I'm not overly keen on the OTT barbie pink forced (read more here) on the current generation of girls and of course I'm keen to adopt a "pro girl" approach to raising my daughter. We received the "Hello My Name Is Cloe" Bratz doll - I'm not sure if that's an alternative spelling to Chloe or pronounced Chl"ohh"
Cloe comes with some lovely accessories, a cute little bucket and spade, necklace, earrings and bracelet, backpack (that really opens) cute little heart sunnies and a hair brush. The outfit confuses me - as a woman, I'm failing to see how an extreme micro raa-raa skirt, denim crop top with bra stitching (why!?) and mammoth platforms is really reflecting today's look and ethos of young girls? 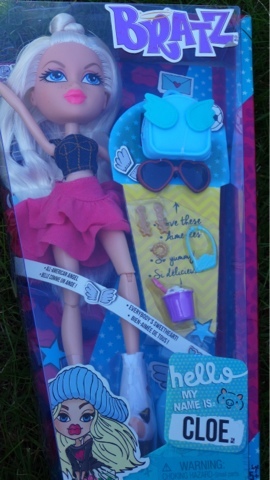 With the bucket and spade and sunglasses I'm assuming it's supposed to be a beach outfit but even still it's a bit "tarty" for my personal preference! The shoes are absolutely massive platforms I wondered if they were supposed to also act as a stand for the doll but she hasn't got any balance at all with or without shoes. Cloe has pierced ears and a lot of makeup which again lead me to some confusion over the today's look and ethos statement and what age this is supposed to be for? Whilst I was left feeling confused over this doll, my daughter was absolutely loving playing with her until she removed Cloe's shoes and disaster struck! 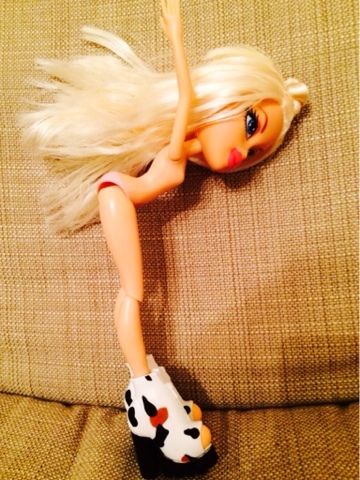 There were lots of tears - my daughter thought she had broken the doll. 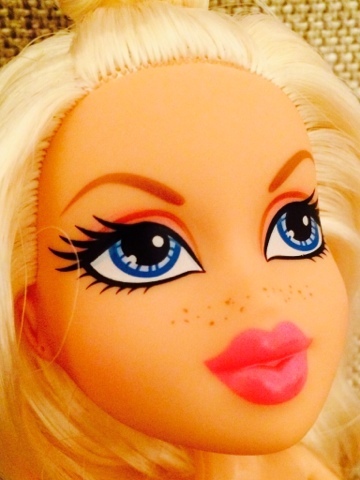 I had to google it and it turns out that Bratz really don't have feet - just nobbles! So you either have to have insane shoes or freaky stumps! I can't express enough how frightening the stumps are to a young girl. Cloe has spindly arms which move at the shoulder but no other articulation, her head can spin and she has really good hip and knee joints. She's made from sturdy plastic and seems quite robust! Her blonde hair is soft and easy to style. As a mum, I'm a little concerned that the body image Cloe is giving out to girls age 5+ is not as positive as it should be - it's certainly not childlike at all. She's got breasts, a tiny waist, low rise underwear with unrealistic lower spine curvature and strange bottom protrusion with a very, very large head in comparison to the rest of her. I'm personally failing to see anything that reflects the launch statement "Bratz, the iconic fashion doll, has been relaunched with a new look and an ethos that engages with today’s girl" my daughter has blonde hair and blue eyes just like the doll but at no point at all in her childhood (particularly age 5-10) will it be ok for her to wear that much make up or an identical outfit to the doll's. I don't know what age the doll is supposed to represent, it's full of mixed messages and contradictions! It's almost like a failed blend of 2 into 1! With a suggestion of age 5+, robustly made doll, described as not being into boys yet, heart shaped sunglasses identical to ones in all the children's departments, pink frilly skirt, a bucket and spade, cute freckles and a toddler style size and shape backpack makes me believe that she is age appropriate, I like this side to the doll, my daughter likes these parts too. But then the outfit with the cropped top with bra style stitching, the pierced ears, the style of the jewellery, and the massive platforms, especially combined with the OTT makeup and strange body shape make me think she's supposed to replicate an 18+ year old! 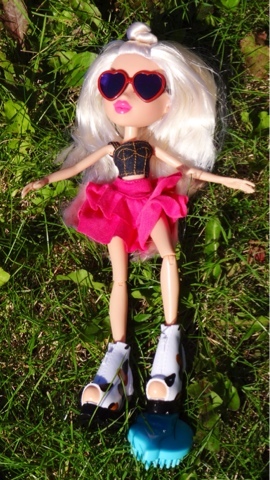 Disclaimer, I received Cloe Bratz doll for the purpose of this review, thoughts, opinions and photos used are all my own. What a disappointing half arsed attempt at a redesign! Completely missed the mark of what today's girl is all about! The new Bratz look exactly like the monster high dolls only without green skin! Shame they didn't do a proper job! In what way does it reflect today's girl? I'm not seeing anything here that identifies with 5 year olds?